It finally happened – the 2008 Olympics were a blast! My children were all of the age where they understood and appreciated the Olympic effort, spirit and championship. The games dominated our attention for over two weeks. Being a “swimming family”, we deprived ourselves of sleep night after night to follow Michael Phelps historic achievements. It was a thrilling ride and hats off to every athlete who was given the opportunity to compete. Recently, my wife and I made a trip to California that provided my “Olympic Moment”…including a chance encounter with Gold-Medalist Shawn Johnson in the Phoenix Airport. Our destination was Squaw Valley, California – about 5 miles from Lake Tahoe in the eastern mountains of the Golden State. 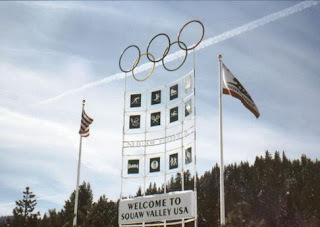 Squaw Valley hosted the 1960 Winter Olympics which was quite a historic happening in its’ own rite. Even though it has been nearly half a century since the last victor received their medal, the awe and mystique of this worldwide gathering of athletic prowess exists even today. Only three buildings remain from the 1960 celebration, but to stand in that valley and imagine the cheers, the crowds, the chill, the cold war standing still for 10 days one midwinter…the Olympic aura became real – giving even greater appreciation for what has become a worldwide tradition. Akin to this was meeting Ken – a weathered man in his late 70’s who served as the Official Starter of the Alpine Events of the 1960 games. The gleam in his eye and the thrill in his voice were obvious as he recalled the joys of victory, the agonies of defeat and the goodness of mankind as seen from his hilltop perspective. Seemingly in the midst of “My Olympic Moment” the thing that kept coming back to mind was “The Great Cloud Of Witnesses”. Isn’t it wonderful to have those who encourage us in this race we run? Not many of us will swim before thousands or walk a balance beam in front of a worldwide audience. But each of us has someone who cheers our every victory and feels the pain in each defeat. Fortunately, we don’t have to travel to China or California to find that support. He’s the Coach to the contestant , the Trainer to the weary, the Seasoned Vet to the rookie, the Parent to the discouraged and the Fan of every participant. Previous PostRemember Me Next PostAustin Caviness Wipes Out!